The conquering of poverty... My pistol-packing mama sent me a collection of “posters” (like the one at right) with factoids about how much the world has improved. While they were all interesting, this one in particular got my attention. The reduction in poverty is something I have personally witnessed over the course of my lifetime, thanks to two widely separated sets of travel around the world. In the '70s, as an enlisted man in the U.S. Navy, I saw lots of places all around the world, especially Asia, Africa, and Australia. Then in the '90s and '00s, as a business traveler, I saw a lot of those same places again, and Eastern Europe in particular. The changes have been dramatic, almost incredibly so. The Philippines, North Africa, Eastern Africa, South Korea, China, India, Malaysia, Sri Lanka (Ceylon), and many more – all have been transformed from generally impoverished societies into vastly more developed societies. Their citizens are indisputably enormously better off than they were just 20 years earlier. What accounts for this? Here's the part that drives the progressives and environmentalists crazy, because it's their enemy that has brought so much to these people. It's capitalism. Those countries have embraced different flavors of capitalism, aided by increased freedom of trade. 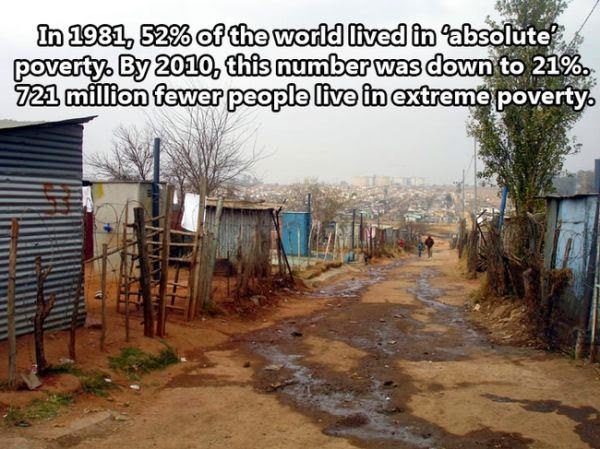 Nothing else can lay claim to the progress that capitalism's incentives brings to human society. Nothing else even comes close. Say that out loud in any gathering and watch the lefties cringe. It's fun!